With Computex just around the corner, a lot of thought is being put to exactly what are we expecting to see at the show. There are questions about AMD’s next generation Threadripper parts, and when Intel is going to launch the Z390 chipset whose name has been floating around for a number of months now. Due to a video published online by bluechip Computer, an IT Distributor based in Germany, some more information is starting to come through. The 30 minute presentation posted to YouTube was a webinar hosted for its business partners. In the video they go through what the rest of 2018 should look like from AMD and Intel, particularly when it comes to chipset offerings. Normally this information is held under NDA until launch, but companies like these will often brief their commercial partners in advance of new products and platforms. Typically this info is also under NDA, but the video was posted to YouTube. This is the key slide. At the top we see the launches that have already taken place: AMD Raven Ridge APUs in February, the second wave of Coffee Lake CPUs in April, and the second generation Ryzen CPUs also in April. What follows is a bit of known and a bit of unknown. Starting at the top, bluechip states that AMD is planning to launch a Z490 platform in June. This is somewhat new to us, although we have sources mention inklings of a Z490 chipset coming. 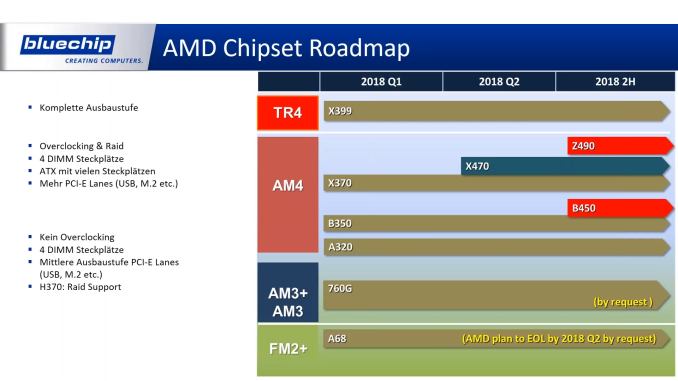 At that time I assumed it was just a mental mistake of confusing it with an Intel platform, but now distributors are stating that AMD has a Z490 chipset coming, which essentially confirms the case. 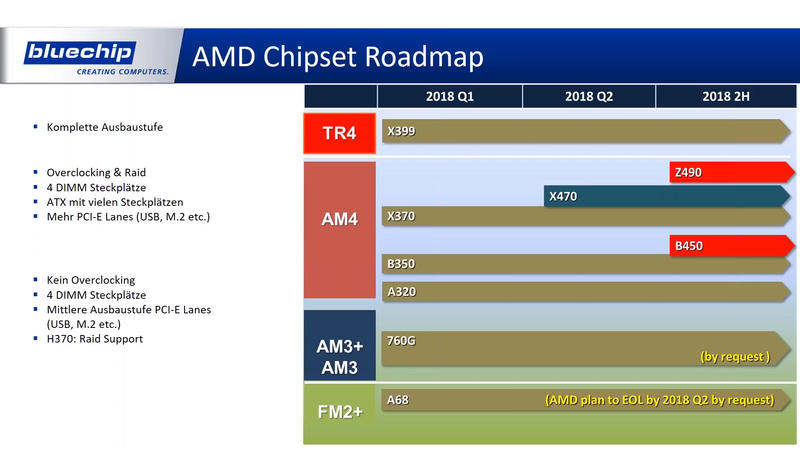 It looks like the future is going to revolve around AMD and Intel having the same chipset names it seems. Whether this platform will come in June or not we are unsure – June is Computex time. As for the features, that is currently unknown – AMD does trail Intel by a long way for what their chipsets can do, such as PCIe lane counts or embedded Wi-Fi. Next is AMD’s B450 chipset for late July, which is an expected release. The previous generation B350 was a lower cost implementation of the X370, so now we have X470 on the playing field that offers lower power consumption, there will be a low cost equivalent. Also known is AMD’s second generation Threadripper, along with a refresh of X399 motherboards. At CES, AMD stated that second generation TR would be coming in the second half of the year, and the presentation lists it as August, so essentially a year since the original TR release. 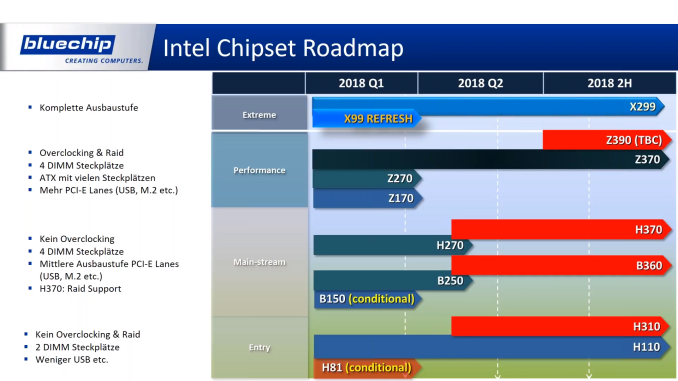 For Intel, discussion on when exactly Z390 is coming out (or another 14nm processor) has been rife. Z370 has now been out for around six months, powering the Coffee Lake processors, and the recent mid-range chipset update with integrated Wi-Fi has been expected to come into the high-end. We still do not know what exactly Z390 is bringing to the market, but bluechip lists it as a Q3 launch. So chances are we probably will not see many motherboards at Computex. 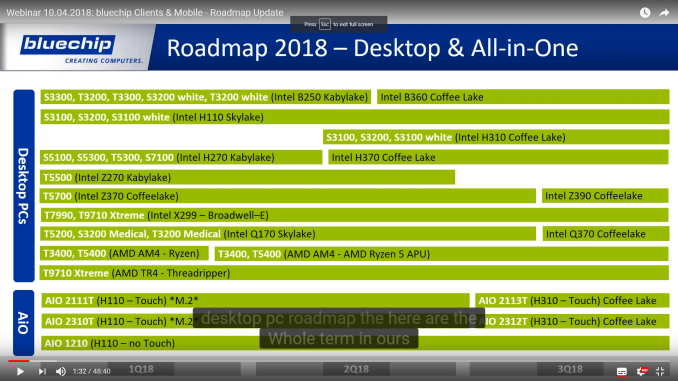 The interesting processor element to this presentation is that it lists an 8-core Coffee Lake processor being launched in Q4, while also stating that engineering samples are going to be in the hands of OEMs in June. This part of the slide is clearly cut/pasted from an Intel presentation, with what clearly looks like a watermark for whoever had the NDA. Some OEMs have accidentally let slip that an 8-core mainstream processor from Intel was inbound during 2018, and this is additional confirmation. I suspect that what people were not expecting was the date of Q4: if we take the exact placement of the arrow in the graph as the due date (as the other arrows seem as accurately spaced), then it would suggest a late November launch. 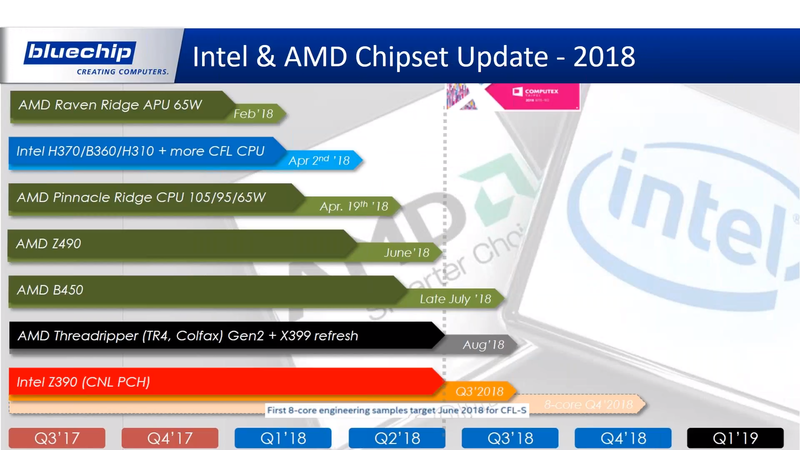 No word in the presentation was given to Cascade Lake or an X299 refresh, which could be interpreted as that we might see it in 2019, or bluechip does not have that information. They clearly list X99 Refresh on the Intel Chipset Roadmap slide, so to see the X299 Refresh label missing could lead to certain predictions, but we have no source on when an update to X299 is due. HStewart: Microcode fixes is one thing (impact on performance). Fixed on hardware level are different. Specially for the way Intel chips behave for Meltdown. As for "legitimate". Just because we haven't seen one it doesn't means there isn't. Governments agencies might have been exploiting this bug to spy. Intel knowingly bypassing the proper procedure and security checks for years in their pipeline is just a smear by Google? When you purposefully BYPASS the checks in place that you claim are in place, someone, somewhere knew. Most likely, many people knew. When instructions are speculatively executed they bypass the check to verify that the instructions were running in the proper security context. The would-be-denied accessed memory is brought onto from main memory into every cache and only after the speculative memory access is finished the check is done to verify that memory was not supposed to be accessed. By stalling the speculative execution engine the memory is then read through the side channel vulnerabilities [which they have known about for the better half of a decade].